Informa-se toda a comunidade FEUP que irá realizar-se no dia 1 de março, às 15h00, na Sala de Atos Prof. Vasco Sá, DEMec (L119), a seguinte palestra: Fatigue fracture of long term operated structural steel components in terms of energy approach, proferida por Grzegorz Lesiuk da Universidade de Ciência e Tecnologia de Wrocław, Polónia. A palestra estará aberta à comunidade académica até à lotação da sala. Fatigue crack growth behaviour in structural components from the old 19th century structures (e.g. bridges) has been investigated. In the course of long-term operation, these steels (especially puddle iron) show susceptibility to degradation processes. Exemplary results of metallographic tests (light microscopy and SEM) and mechanical-properties tests (hardness measurements and static tensile tests) have been performed. The problem of crack closure has been involved in fatigue crack growth process during the experiments and its understanding is fundamental for the analysis of stress ratio effects on KFFD (Kinetic Fatigue Fracture Diagram). An experimental and numerical approach has been developed for the evaluation of the crack closure/opening forces based on the hysteresis loop deformation. The implemented algorithm in the numerical environment gives promising results in the description of the kinetics of fatigue crack growth of the old metallic materials with consideration of crack closure effect. The problem of fatigue crack growth rate description from the energy point of view has been presented and discussed. In this case, the theoretical and experimental results of fatigue crack growth from modern and old steel have been presented. According to the theoretical background - the energy parameter ΔH is introduced as a crack driving force in construction of fatigue crack growth rate (FCGR) diagrams. The physical explanation of this model is also presented. In experimental parts of this work, the kinetics fatigue fracture diagrams (KFFD) for AISI 5140 steel were constructed. As it has been confirmed, the energy parameter ΔH describes the kinetics of fatigue crack growth much more synonymously than the classical stress intensity factor - ΔK. 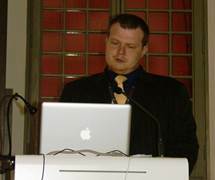 Dr Grzegorz Lesiuk is a lecturer in the Department of Mechanics, Materials Science and Engineering, Faculty of Mechanical Engineering at the Wrocław University of Science and Technology. The research field of Dr. Lesiuk is connected with the microstructural degradation processes and its potential influence on the mechanical properties of long term operated steel structural members. Another important part of research is Fracture Mechanics and Fatigue Fracture in terms of energy methods. During the last four years Dr. Lesiuk extensively cooperate with Polish and European companies in R+D, Energy, automotive and railway sector. Dr. Lesiuk at Wroclaw University of Science and Technology conducts regular lectures and classes: classical mechanics, dynamics, differential equations, fracture mechanics. He is invited as a guest lecturer to The Witelon State University of Applied Sciences in Legnica, Poland (lectures in: Fracture Mechanics, Lightweight Structures, Engineering Failure Analysis). Dr. Lesiuk is a member of Polish Group of Fracture Mechanics.